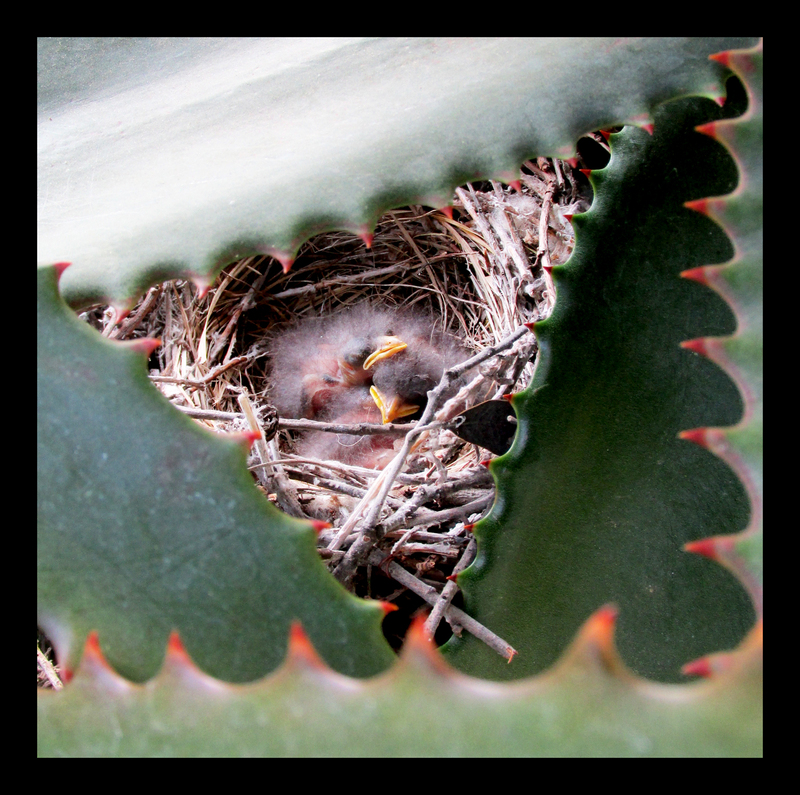 It was just about two weeks ago I first noticed there was a nest — this nest — secreted between the serrated leaves of a low-growing clump of aloes. And, it was just over a week ago that I peered into the nest and saw three fluff-laden baby birds there. After taking the photos for an earlier post, I was obsessed with the babies; I couldn’t stop peeking in on them several times a day. Of course their mother, a nervous-seeming mockingbird would swoop in whenever I was in the vicinity, hopping from branch-to-branch in the nearby pepper tree, emitting a low skreeeeh-skreeeeh, until I left. So it went, until Wednesday, when I noticed the babies were suddenly not only bigger but their feathers were looking very mature as well; how exciting! I was busy Thursday morning and didn’t get to see the babies until the afternoon when I was met by a surprise: The nest was empty. I was shocked; I couldn’t believe the babies had matured overnight to the point that they just flew off to their destinies. That’s when I saw it: The smallest of the babies was still there — not in the nest— but just outside it. I reached in to pull it out, thinking it had fallen from its protection, but my fingers came away crawling with ants. The baby was dead … Suddenly I felt like an intruder; I walked away. That night, I couldn’t stop thinking about the baby mockingbirds: the larger two with enough strength and plumage to fly off to their own lives, and the dead bird that succumbed because it was the runt and therefore not fit enough to survive. I couldn’t but accept as Nature’s plan what became of the birds … yet there’s a nagging small part of me that wonders whether my peering eyes somehow altered their fates. I visited the nest once more this morning, this time to extract it from it’s spiked enclosure. I took it from there so that I could share it with you and to make sure it wouldn’t be used again. It’s too low to the ground, too much a temptation for peering eyes. Awww……sweet sadness…amazing birdies in our gardens…..I wonder where do they go….they never seem to be nearby….just gone….! The huge nest that fell from our pine tree with eggs smashed from the fall has turned into something I wouldn’t have expected. I placed it on our bench for walker-bys to see and it now has pine cones in it….sort of a memorial for what might have been…..and a thank you to the birds who bult such a beautiful nest. It was sad, Guida, but I had to preserve the nest … I love the idea of your nest being on display! Look how beautiful the nest is! God is really amazing. I thought it was an amazing nest, too. Thanks for commenting, Doretha! It is a beautiful nest and I’m glad you have it. I don’t think you looking in on the babies did any harm, I would have done the same thing. You’re welcome, Judith. Thanks for reading. I’m a wild bird rehabber.When babies fall out of the nest, put them back. 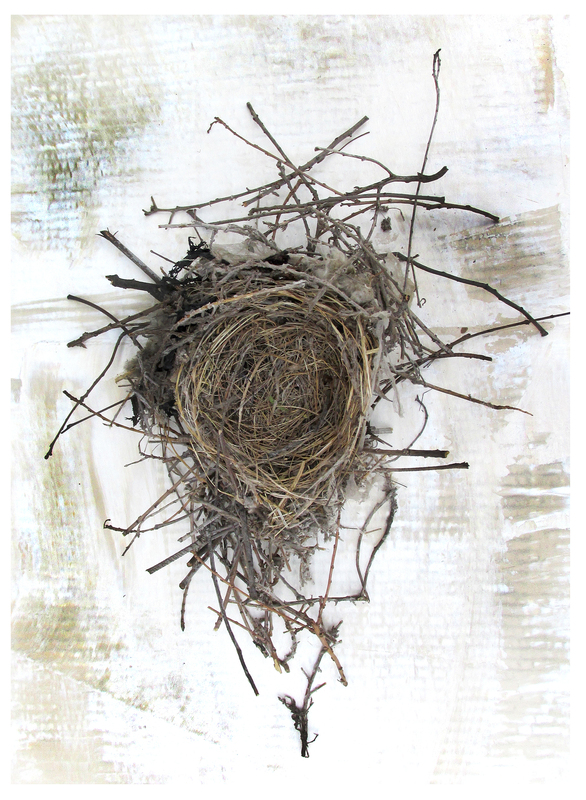 If the nest is not secure or has started falling apart, put it in something (an old tupperware bowl, for example) that you can wire into the tree or nearby. The parents will find it. They invest a lot in their young and don’t want to abandon them. Thanks, Maude … I appreciate the information.